1923: Steve Casey (Aged 15) rowed in the Sneem senior crew with his father and the O’Connor Brothers..
March 3, 1936: Steve Casey defeated Paul Duveen (Irish Canadian Heavyweight Champion)..
March 17, 1936: Steve Casey vs. Rex Steele at Embassy Ring, Catford (Billed as 2 Submissions, 2 falls, 2 k.o.).. October 1936: Steve Casey is brought to America by promoter Paul Bowser. December 14, 1936: Steve Casey defeated Mike Mazurki in New York City in front of 3,500. July 26, 1937: Steve Casey vs. Marvin Westenberg at the Municipal Stadium in Syracuse, New York. February 11, 1938: Steve “Crusher” Casey defeated Lou Thesz to win the NWA World title and the AWA Boston World title..
August 26, 1938: Steve Casey drew Danno O’Mahoney in Milltown Dublin after ten 5 minute rounds in the European style. September 1938: The NWA title was stripped from Steve Casey due to his being out of the country..
~~~Some view that Steve Casey held the NWA title until his retirement in 1947 but that is untrue. September 18 1938: Steve Casey defeated Danno O’Mahoney in Munster in a finish match in 18 rounds and 97 minutes..
~~~Reports say it was a thrilling match which turned in Casey’s favor when O’Mahoney fell on his head to the floor..
March 2, 1939: Marvin Westenberg defeated Steve Casey for the AWA Heavyweight Title in Boston, Massachusetts. March 29, 1939: Steve Casey defeated Gus Sonnenberg for the AWA World Heavyweight Title in Boston, Massachusetts. April 18, 1939: Ed Don George defeated Steve Casey for the AWA Heavyweight Title in Albany, New York. October 19, 1939: Steve Casey vs Everett Marshall was a 60:00 draw in Toronto, Ontario, Canada drawing 4,500. November 23, 1939: Steve Casey defeated Wild Bill Longson (2-1) in Toronto, Ontario, Canada drawing 4,000. November 29, 1939: Steve Casey defeated Ed Don George for the AWA World Heavyweight Title in Buffalo, New York. May 13, 1940: The French Angel defeated Steve Casey for the AWA Heavyweight Title in Boston Massachusetts. 1940: Steve Casey defeated U.S. boxing champion Tiger Warrenton and challenged Joe Louis. Louis refused a fight. January 20, 1942: Steve Casey vs Earl McCready ended in a draw in Toronto, Ontario, Canada..
May 1, 1942: Earl McCready defeated Steve Casey in Buffalo, New York..
May 14, 1942: Steve Casey vs Earl McCready ended in a draw in Toronto, Ontario, Canada..
May 14, 1942: Steve Casey defeated The French Angel for the AWA Heavyweight Title in Boston, Massachusetts. August 1, 1942: The French Angel defeated Steve Casey for the AWA Heavyweight Title in Boston, Massachusetts. 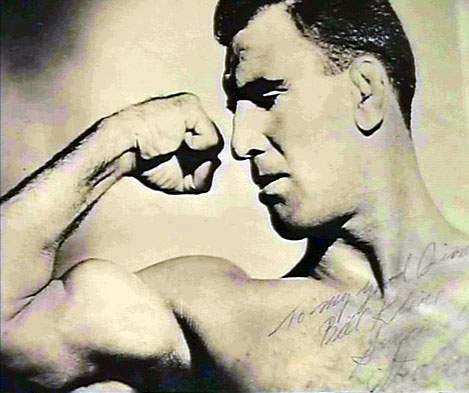 August 15, 1942: Steve Casey defeated The French Angel for the AWA Heavyweight Title in San Francisco, California. August 1, 1944: Maurice Tillet aka The French Angel defeated Steve Casey for the AWA World Heavyweight title..
June 6, 1945: Steve Casey defeated Frank Sexton for the AWA World Heavyweight Title in Boston, Massachusetts. 1983: The Casey family organized a family reunion in Sneem, Ireland. ~~~Five of the seven brothers rowed the same boat they had used to win so many championships..
Special thanks to Justin Boulka for supplying the content for this profile — really great work!.. Justin Boulka wrote: Steve’s father, Mike, was a renowned bare-knuckle boxer and was a sparring partner for John L. Sullivan and Martin “Farmer” Burns. His mother, Bridget was a champion oarswoman. Bridget’s father was a local strongman known as Johnny Mountain. Steve Casey’s daughter, Margaret, became a distinguished oarswoman while attending Harvard University. Rumor has it that Steve Casey’s hands were 15 from the point of the thumb to the point of the little finger. There is a life-sized statue of Steve Casey on the left as you leave Sneem on the Killarney road. Steve Casey was a member of the US Army around 1942.